Home / Featured / Kohaku / Koi Show / Tancho / Baby Champion! Project objective achieved. Baby Champion! Project objective achieved. 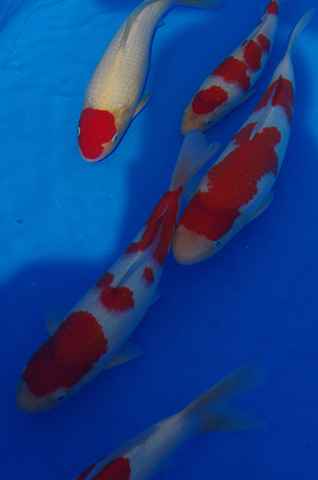 Last Sunday, I took my home bred kohaku’s (and tancho!) to the South of England koi show. They performed better than I could have imagined, and to be honest, I’m a bit shell shocked. Let me start with the facts and figures. 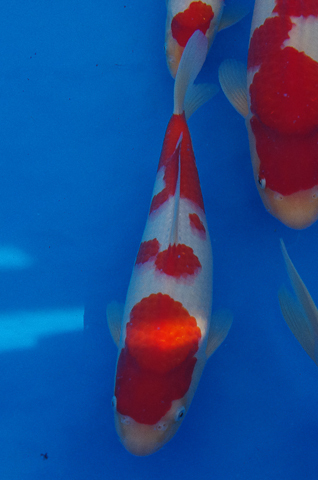 Remember my project objective… to win a competitive award with a home bred koi. Well, out of the 10 koi I exhibited – 7 of them won competitive awards! By way of context, and for those who havent been to a show - let me lay out the categories that the fish compete in. Each fish is measured and placed into a size category. So, 15-25cm go into Size 1, 25-35cm go into Size 2, 35-45cm go into Size 3 etc. 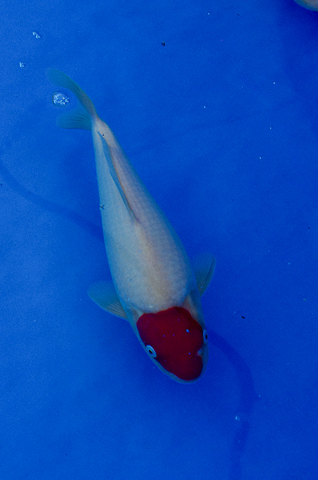 Then, there are also 13 different variety categories – I entered fish into two of them, namely, Kohaku, and Tancho. 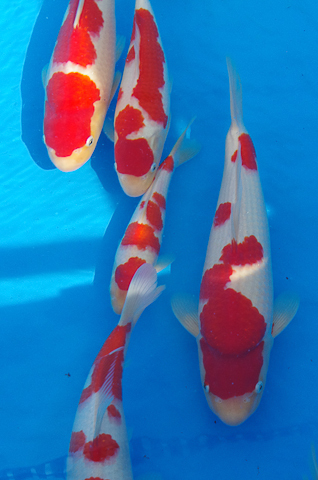 So when the fish enters the show – it is placed in a “show class” made up of it’s variety and size – for example, Kohaku Size 2. 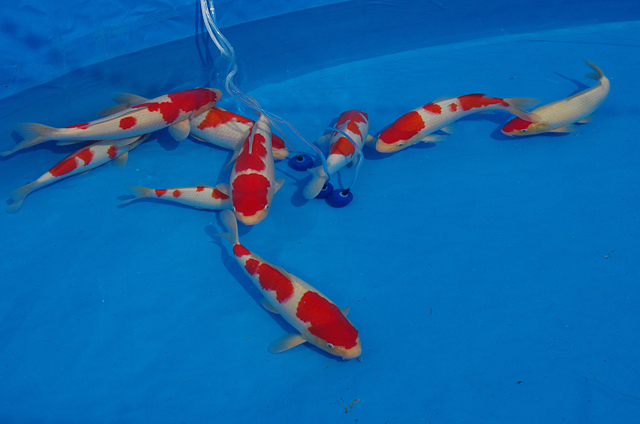 The judges then judge the koi in each show class, awarding 1st, 2nd and 3rd places. The first level of awards are made in the size and variety show class. 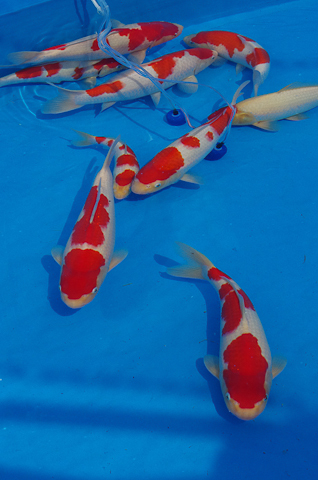 For example, “Kohaku Size 2” category are all the kohaku’s that are between 25-35cm. The next level up after that pitches size groups against each other, to give the overall champion awards. 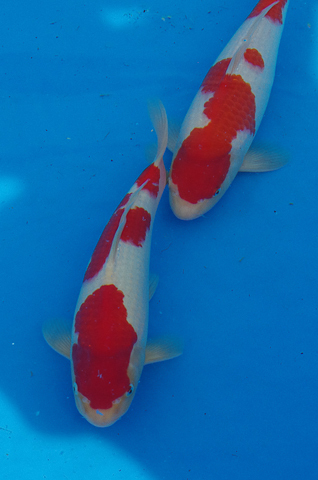 These are highly coveted, and Baby Champion is the best koi out of Sizes 1 and 2. Young Champion is the best out of Size 3 and 4 etc. 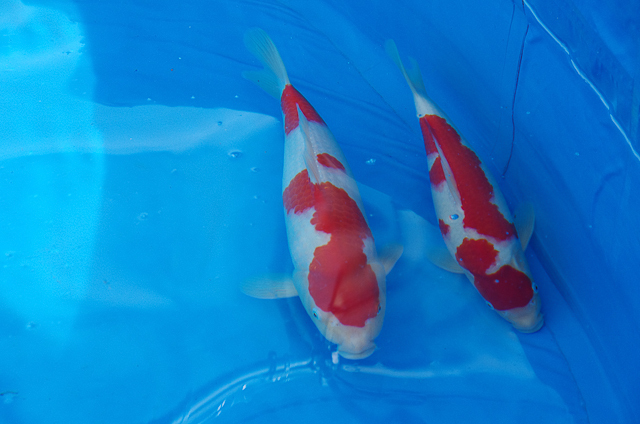 I came 1st out of 2 koi in Tancho size 2, and 2nd out of 7 koi in kohaku size 1. And to top it all off – two of my size 2 kohaku’s were in contention for Baby Champion, and one of them took the coveted prize. There were 80 fish competing for this prize. - thank goodness I ran the July 14 spawning, using the female for the second time in one season! Because the July 14 spawned kohaku's won all my best prizes! All the size 1 and 2 prizes came from the July spawning, and when I pitches May 14 against July 14 in Size 3 kohaku - the only July 14 spawned kohaku large enough to make it into size 3 (ie, the largest koi in the spawning), came first in kohaku size 3 - my best placed May 14 spawned kohaku came 3rd in size 3 kohaku. (I still think the May 14 spawning fish will do better in the longer term). 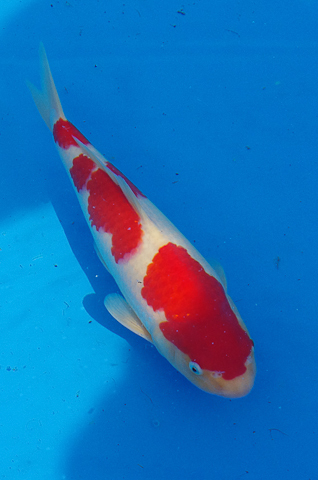 But really happy that not only is this koi the largest in the July 14 spawning, but it also has quality too! - locking out size 2 kohaku, and almost fully locking out size 2 irrespective of variety - awesome! so my home bred koi have some strength in depth as well has having a cover star or two. supports my decision to breed kohaku; one of the toughest varieties to breed, but clearly they have good show potential if you get a good example. and, thats what's happened. one of my favorite's but didnt win an award. Koi on the right - one of my favorites, but didnt place in the show. I received some feedback as to why, and it's to do with the white colour - it's a little on the creamy side compared to the white whites on the fish it was competing against. I'm going to change the feeding regime for this koi in an attempt to whiten it up a little. could be an interesting test case to give me some intel on the brood set used to breed this koi. The two step - top right. 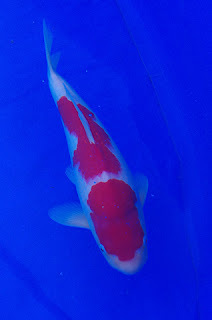 I've profiled this kohaku on my blog in the past few months. When it was small, the hi (red colour) really stood out compared to it's peers. But the red wasnt looking so good just before the show, and we almost didnt take it. It did ok at the show, coming 3rd out of 10 koi in size 2 kohaku. Hi Adam. I left a comment on a few previous, so I thought, I'd leave another just incase you hadn't seen them. Congratulations on your success in the show, they all look amazing, well done! Just a thought, previously I remember your fear of overstocking the pond with newly spawned fry. Why don't you select a few to keep behind in a separate vat and put them on eBay in bags of say, 100? I've seen a few dealers do this, such as New Forrest Koi, It's just an extra bit of revenue for fry that may have died due to overstocking, and gives us a chance to experience a new form of Koi keeping. Obviously, it's up to you, and you may have trouble with lack of space and all, but it was just an interesting thought. Hi Matt, thanks for your comment and sorry for taking so long to respond. On the fry - I see your logic, and perhaps there's something in that; Thing is - I'm not confident yet about the yield % - comparinging the number I put into a pond, and the number I get out. So, restricting the number that goes in would feel risky to me, although it probably makes sense. I am also working with limited time and resources, tanks etc - so there's only so much I can manage and look after, and I'm at the limit of what I can do. I have to prioritise time, resources etc towards my project objective to stay on track and that is is breeding my own show winners, not maximising revenue - and with that in mind, taking some of that time to look after very excess fry wouldnt make sense. I'd also encourage hobbyists to support the trade, and as there are companies like New Forest Koi that specialise in fry, seems like a good place to go to buy some. If I end up with full fry ponds and an extra female to spawn before the end of the summer - then I could envisage spawning her and hatching the eggs and giving some newly hatched fry away to interested hobbyists in small quantities - perhaps as an offshoot of my project; there may be some benefit in other's raising fish from a brood set combo that I havent yet tested and dont have space to rear - a bit of extra intel on those brood set combos would be really helpful to me, and the hobbyists would have a chance of a new husbandry challenge - like you say. It's an idea ... That's something for me to think through, but like I say, it's low priority. Thanks for the reply! Yes, it was just a thought to cover the cost of some overheads, but I did fear about time and space restrictions. Anyway, I'll keep trying to buy a some of your fish, they look fantastic! Thank you!